Aberdeen-based maritime specialist has appointed a new engineering manager as it looks to develop more specialised offshore marine projects. Seacroft Marine Consultants has appointed Richard Pearce to the role of Marine Engineering and Dynamic Positioning (DP) Manager. Pearce has sixteen years’ experience in engineering and technical disciplines of the marine and offshore industry, including spells at some of the sector’s most prominent names. 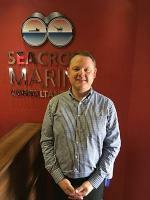 Most recently he was technical manager at Fletcher Group and service delivery manager at Bibby Offshore in Aberdeen and was responsible for the safe and reliable operation of the company’s offshore support vessels. Pearce has also served in seagoing engineering positions and been technical superintendent and technical manager with major offshore vessel operators.